I’ve actually never struggled to leave Nottinghamshire as much as I did last Friday night. After fully two and a half hours we were merely sampling the delights of Blythe services around 30 miles north. What fun circumnavigating those plastic cones in a darkened services car park though. An unmissable experience. We arrived. Luckily it was still November – just. Edinburgh worthy, Conan Doyle’s hero, Sherlock Holmes himself would have been useful in detecting some alcohol for the weary travellers. Whatever happened to ’24 hour Edinburgh’ may I ask? Satisfyingly we saw our first example of the ‘Edinburgh Two-Step’ as a gent took one sensible step out of a bar and the next one skittering sidewards towards the gutter. Ah – home at last! A tour of parts of the New Town and finally a drive up Broughton Street provided little satisfaction in the ways of a pub still welcoming a little custom. Finally we clicked with some advice to visit ‘Pivo’ just off Leith Street, apparently open until 3am. Back to a strangely peaceful sleep back at the excellent apartment the four of us were sharing and up at the crack of noon to take on the challenge of an Edinburgh weekend after a shattering drive. The first thing was to get the obligatory run out of the way during the morning hours without ‘losing the day’, what a gem was to await my first faltering steps down the road. The apartment in the Canonmills area was placed well – next to Edinburgh’s historic river, the Water of Leith that runs eighteen miles from it’s source in the Pentland Hills to the shore at Leith. No stranger am I to Edinburgh of course but to my discredit I’ve never explored the Water of Leith and now seemed the perfect occasion to begin. Besides I wouldn’t pull my usual trick of getting hopelessly lost on my holiday runs as it was possible to follow the trail of the smooth running water. 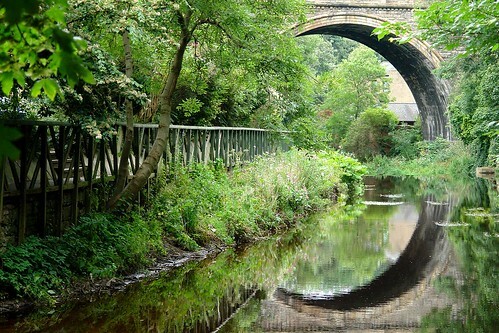 How delightful is this route to Leith. Indeed it was difficult to imagine the river ran through the middle of a large city, only by recognising signs of Edinburgh’s industrial past via the water’s weir’s and odd assortment of buildings, chimneys and other symbols of a living hard earned by the Water of Leith. Finally emerging at the shore, passing Martin Wishart’s restaurant amongst the many others of the area’s favoured restaurant district I turned around at Malmaison and headed for home, satisfied with the exercise and sated with the views. It’s always a pleasure showing others around somewhere you know well isn’t it? What can become hackneyed over the years comes into sharp focus through the eyes of a first-time visitor. A first port of call coincidentally was stepping off a bus near to Greyfriars Bobby, or more accurately the monument to the aforementioned Skye Terrier. An attractive story this, Walt Disney and other men of celluloid have strived over the years to portray the heroic and loyal little dog. Onwards then to the Grassmarket. Did I say the Grassmarket? Unfortunately a bespoke hat shop came into the female cross hairs very quickly and two of the party were soon lost to the millinery delights inside. What seemed like several days later the two emerged and were spotted in another ‘specialist’ shop on nearby Victoria Street selling all those little essentials such as ‘bramble vinegar’ and ‘Strawberry oil’ or some such concoctions. How do people manage without these things in other parts of the country? It’s a mystery. I dared to ask my friend ‘what the hat was like she had spent the past three hours admiring?’ to the answer of ‘sixty pounds’. There are many ways for women to bring about an abrupt end to a conversation with a man and this was a spectacular example of the art form. 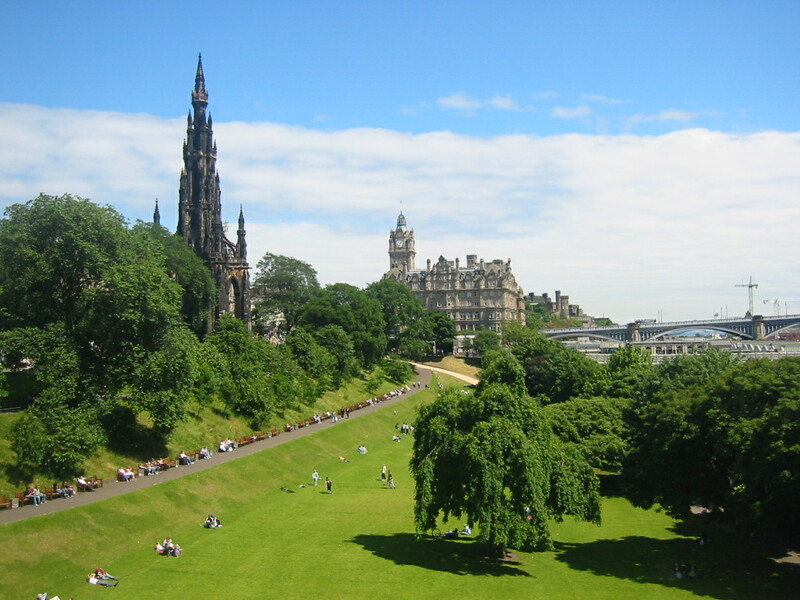 A coffee priced at just £15.70 from a Grassmarket Italian deli cafe later, it was on to Victoria Street and Terrace and up to the Castle esplanade – surely one of the coldest places on God’s earth after the North Pole? American tourists die of exposure in July in this place. Thanking the flimsy jacket, an investigation into the Whisky Museum nearby was in order, well it was warm in there. We booked a tour with just the requisite time left to disappear to the dear old Ensign Ewart nearby to tip a pint back in double time. I’ve always loved this little pub. It really couldn’t be in a more touristy place if it tried in The Lawnmarket with the castle a hop-skip away but this never seems to detract from it’s warm ambiance. Cast almost in complete darkness I felt my way to the bar and identified the whites of the landlady’s eyes after a time and managed to order the drinks. The trick to this pub is getting into the bathroom. If you’re not a customer you can’t. On purchasing a drink you’ll be passed the secret code for that place. Even James Bond didn’t have to go to these lengths to powder his nose. Time rolling on and darkness crashing in (well it had passed midday) the four of us split up, ostensibly to shop or alternatively visit Mary King’s Close Unfortunately the Close appears to be an incredibly popular choice for visitors these days as we were to find out over the weekend. Two of us instead walked to the foot of the Royal Mile for a peek at the Scottish Parliament building. I’m sure we’ve all had those days when we’re ten minutes late for practically everything? Like a cascading domino effect? Ah well it didn’t really matter as we enjoyed out stroll and chat in the environs of the auld town. Could someone kindly explain that building to me though? 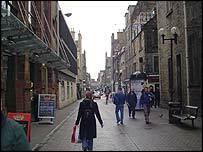 A personal crusade for me was a stroll with my friend down to St. Patricks in The Cowgate. The kirk has much history and was in the centre of what was known as ‘Little Ireland’ in this part of the old town. In the days of poor Irish people leaving their homes due to the potato famine this area saw those cousins of Scotland frequently coming over to sleep over thirty to a dark and dank room. Canon Edward Joseph Hannan, an Irish priest saw the difficulties presented to his flock and sought to find something for the young Irish lads of Little Ireland to keep them out of trouble, to be abstemious and to attend Mass. So in 1875 was founded Hibernian Football Club, based at St. Patricks. Worshippers were just gathering for five o’clock Mass as we peered around the doors but in an ante-room at the front entrance was the very thing I came to see. The kindly Canon is remembered in marble as one enters the kirk. Finally seeing the plaque after so many years was a very touching moment for me. Forget maybe the fact that Canon Hannan was an Irish Catholic priest, forget also that he founded Hibernian, but always remember the things he stood for, kindness, benevolence, love and charity. God will always bless you Canon Edward Joseph Hannan for the good work you did. To the evening then and a visit to an old favourite, Vittoria’s restaurant on Leith Walk. Vittoria’s has always been a reliable and enjoyable night out and although our time there was to be curtailed supposedly to refill our table with more diners this did not materialise. Let me recommend Vittoria’s, although slipping upwards slightly in price with a new menu, it retains great food at a reasonable price. The service is friendly and the restaurant authentically Italian as it has ever been. After the meal it was time for a short detour to Rose Street . The dark night was still providing plenty of opportunity for rainwear shall we say, although it had slowed by now to a mere torrent. It makes for all the beautiful burns, rivers and lochs they tell me but why does it always rain on Friday and Saturday night specifically? The Kenilworth was the same as ever though somewhat quiet apart from a straggle of Scotland supporters drowning their sorrows after the ‘Italian Job‘. Avoiding the traditional indigenous-to-Edinburgh rickshaws displaying lurid signs suggesting we visit the ‘Fantasy Palace’ we trooped on through the increasing rain to The Abbotsford. I have to admit I have always loved this little pub at the east end of Rose Street. There’s nothing particularly unusual about it save there is an excellent example of an ‘island bar’ in there but it’s somehow just so civilised. The service is efficient and polite, the clientele informal and interesting. A drink around the New Town area of the city for me will inevitably culminate in a step through the doors of The Cafe Royal or The Guildford Arms next door (preferably both). The renowned former I have a love-hate relationship with.With it’s murals, carvings and ornate ceilings it is truly a classic Edinburgh pub – maybe the classic. I do however have some sore memories of long hours spent at the bar and the long wait to be served. This reminds me of a shared UK-American friendship initiative I once participated in inside the Cafe Royal, (actually It was just a booze-up with an American tourist which lasted all night). His classic rhetoric went something like, ‘wow – look at those ceilings man, they’re just amazing’. Followed by the observation: ‘I could stay here all day…actually I think I just did’. It was a quest for fresh air that took us to Portobello the next morning. Where better to find it than dear old ‘Porty’? I never see the old resort quoted in any list of hangover cures but it has come to my aid on many an occasion in the past. I love Portobello, yet I’m not exactly sure why. A nice residential area for sure and who wouldn’t want to live close by a beach? The potential for the old town remains largely untapped in my view and with the escalating prices of living in Edinburgh I’m not sure why this is. I hope to see a renaissance for it one day as it is a place I am very fond of and have ties with. After spotting a future seven-year old Hibs striker practising his skills down a back alley and a stop for coffee and a meet with a dear friend it was time to head back to the big city. The ‘Pubic Triangle’ as it is delicately known demonstrates that the gritty underbelly of Auld Reekie is never that far away. Years ago in the 1970s’ this street configuration upwards of the Grassmarket was renowned for the go-go dancers in the local pubs. A dancing lady in a suspended cage over your lunchtime pint anyone? Nowadays it is the modern fashion for pole and lap dancing that is catered for. The ‘Famous’ Burke and Hare pub proudly displays it’s services outside – straight opposite on the triangle sits an establishment known as ‘The Erogenous Zone’! My friend claiming a photograph was essential of the pub named after the erstwhile bodysnatchers managed to open the camera’s shutter just as a pleasantly satisfied looking middle-aged gent popped out of the front door of said establishment. The blackmail photograph will be with you forthwith, sir. The trip was not quite over however. We took an impromptu break from the stresses of the A1 to drop into a pub in a town near Durham which shall remain nameless. I’d always wondered where the guests from TV’s ‘The Jeremy Kyle Show’ were recruited and this night I finally found out. The only person in the whole pub that didn’t appear to be clearly out of his head was the young barman. At the bar was a drinker of indeterminate gender with a short brown bob underneath a trilby hat. He/she was the recipient of a couple of arch-winks from a drunk in the bar opposite. Meanwhile an apparently physically disabled young chap was managing to clear the table of every standing drink onto the already sticky carpet. He was only getting up to go to the bathroom too. All of human life (and subculture too) was in this pub. I kind of liked it. For once in my life I felt quite sophisticated. Home to snow then almost unbelievably the final junction of the motorway was adorned in white but merely rain in the city. We arrived home around midnight, tired but with a lovely weekend behind us. Thank you to Melanie, Clara and Lesia for making it all possible. I certainly had a birthday tale to remember. Oh I was born and bred there, Di. My local intelligence on the ground serves me well too! I suppose that like other places there are many visitors that head towards the well-known places in the busy tourist areas. I’d say there are a tremendous amount and variety of places to eat in Edinburgh though. I hope you enjoyed your stay and thanks for your comment.